BOSTON, March 22, 2017 — (PRNewswire) — Legendary Italian pop music icon Iva Zanicchi (Non pensare a me, Zingara, Ciao, cara, come stai? 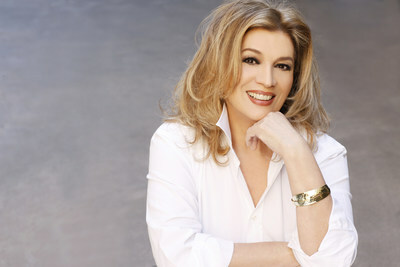 ), the only female vocalist to win Italy's famed San Remo Music Festival three times is a row, will make stops at on May 6 at Toronto's Capitol Events Theatre and on May 8 at the Teatro Corona in Montreal, in celebration of Festa della Liberazione!, a multicity, North American tour in celebration of Italian-American pride and culture. Co-headlining with Ms. Zanicchi will be her hosts, the iconic, Rock & Roll, Vocal Group and Grammy Halls of Fame vocalists, The Platters® (Only You, Great Pretender, My Prayer, Smoke Gets in Your Eyes). Ms. Zanicchi and The Platters represent the multigenerational kinship that symbolizes the unity of the Italian and American people via the universal language of music. The purpose of the tour is threefold. One: To celebrate and thank the American people for liberating Italy from Nazi occupation under reviled Italian dictator Benito Mussolini on April 25, 1945. Two: Raise awareness of Italian arts and culture in honor of the international release of the new, critically acclaimed Italian comedy-drama Briciole Sul Mare. The motion picture is currently under consideration as an official nominee for a prestigious David di Donatello Award. Three: To raise funds for the Italian Red Cross to help the victims of central Italy's recent earthquakes. Briciole Sul Mare tells the story of a fisherman living in the south of Italy whose regular fishing trip takes an unexpected turn when he falls asleep. During his slumber, he drifts south to the waters of beautiful, sunny Sicily. There he meets many new people, including Salvo, a young man who finds himself in a whirlwind of romance, family drama and legal trouble—all which could completely alter his future. The film is full of dramatic and comical waves that rise and fall so unexpectedly that any avid roller coaster rider would be envious. During the tour, Ms. Zanicchi will introduce three of Italy's rising star vocalists to North America—Briciole film star and director, Walter Nestola, Paola Gruppuso (from Italy's RAI-TV's The Voice), both of whom are featured on the films official motion picture soundtrack, and Italy's hottest new music sensation, Amato Scarpellino. The multicity, North American tour, produced by the Balboni Communications Group, LLC, kicks off in Boston on April 22, 2017, with stops in Providence, Rhode Island; Hartford, Connecticut; New York City; New Jersey/Philadelphia; Washington, D.C.; Chicago; Cleveland; and Buffalo, New York. Tickets and information on Iva Zanicchi and The Platters tour are available online at: www.vivaitaliano2017.com.